Every year this comes round, it’s an event I look forward to, but it goes hand in hand with dreading it at the same time, you know what’s coming and what they’re up against. I probably write about this every year, you can’t help getting attached to them monitoring them month after month and year after year, some juveniles you know will not make it, the 1st week of fledging is likely the hardest part for them to overcome. 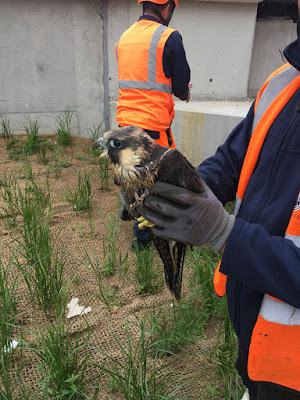 Of course like anyone, it gives me a great deal of satisfaction when I retrieve a juvenile after grounding, certain nest sites/buildings are not always ideal for fledging and you know that the 1st flight is going to be harder than most, especially trying to get back to height. Paul is helping me no end, he recently returned 2 juveniles back, both from the same nest site and picked up from South Essex Wildlife Hospital. As I have said before they do an incredible job, if you want to donate to a good cause, this is it. 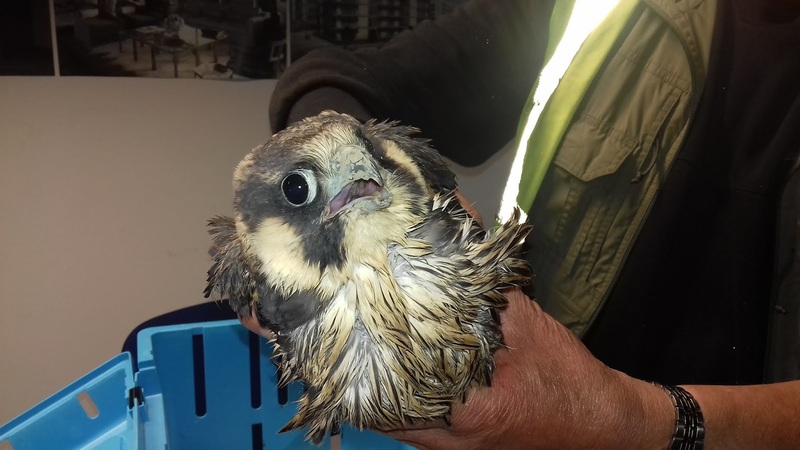 Both juveniles were taken on a train by Paul, with London’s traffic it’s the only way to get them back without sitting for a few hours in the rush hour, let the train take the strain. Paul is now also ringing all the juveniles we put back as well, good data that may one day be used to see where they turn up. 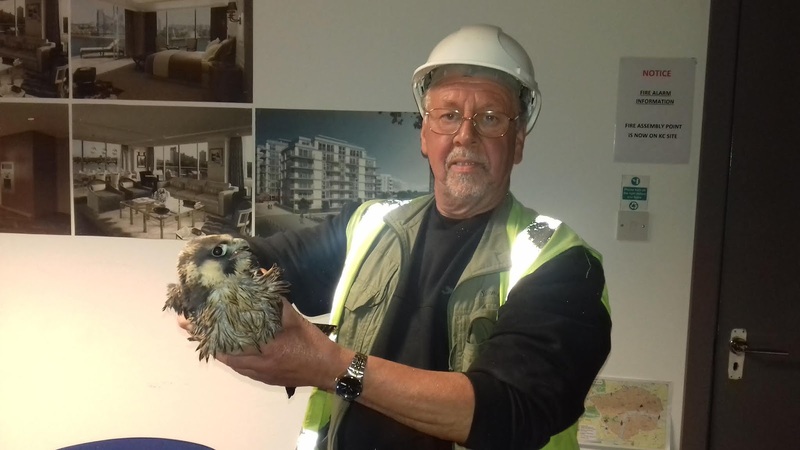 One of the juveniles that Paul returned was the bird that came down in the Thames, quite incredibly rescued by Construction workers, how they managed it I don’t know, the bird actually ‘swam’ with its wings towards them. From what I understand they were able to hang down from the side and grab the bird. To date 7 have come down on their maiden flights, an urban environment is a dangerous place with many pitfall’s to trap a juvenile, glass see through balconies to name just one. I have rescued a good few over the years that just sit behind the glass, totally confused that they can see the outside world but can’t get through the glass. 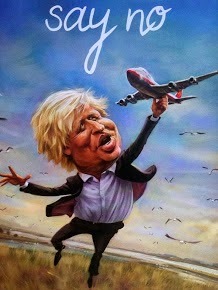 At this stage also, they lack the wing strength and vertical takeoff prowess to clear the balcony. On the other side of the coin however without these, many would end up on the ground and likely prey for Foxes if late in the day, the biggest thing however is the public, they have been incredible. I retrieved a juvenile recently that had crash landed into a balcony late afternoon after being mobbed by 2 Crows low down. It came to my attention the following morning after spending the night on the Balcony thankfully, the owners were marvellous. 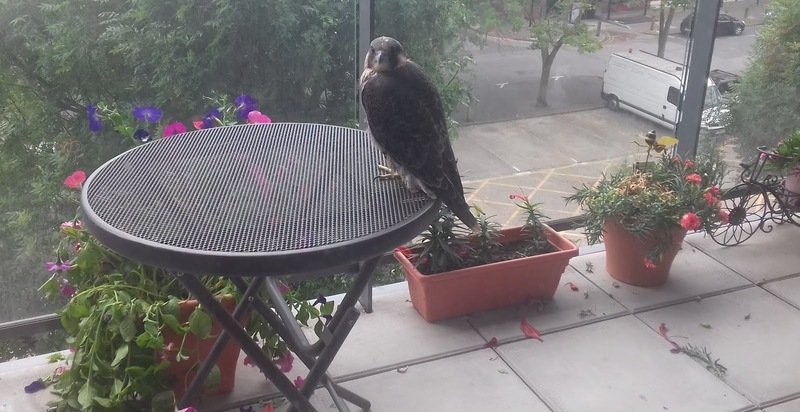 The juvenile, in its attempt to escape, had trashed most of the flowers on the Balcony but all they could think about was the bird and its welfare, great people as are all that I meet when I retrieve a juvenile. 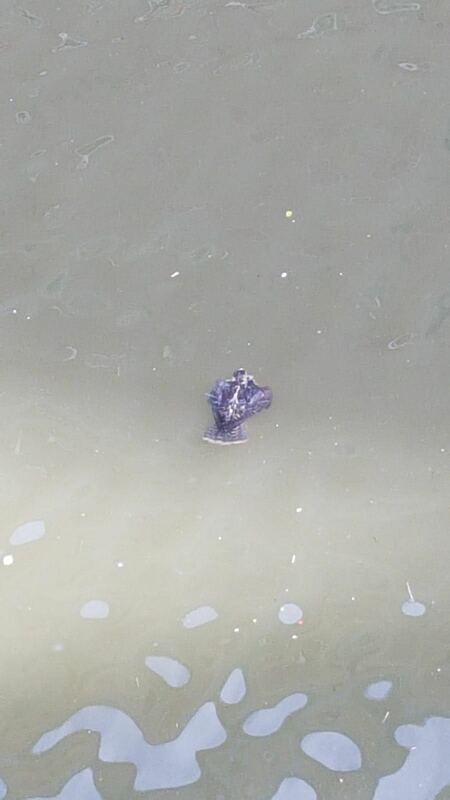 Sadly one juvenile was lost at a site after ditching in the Thames, it just makes you realise the water hazards that many coastal birds must face. Hats off though to the Public and Construction workers, many juveniles wouldn’t make it without there help. I have visited the site a number of times in May, remarkably the Common Buzzard is still on site despite the attentions of the local Corvids and large Gulls, both are breeding locally so as you can imagine they get quite upset at its appearance. Whilst watching the Buzzard on a couple of occasions, I saw a male Sparrowhawk come out of nowhere and mob the Buzzard, both scenario’s it happened in the same area. I know there is an old nest there as I marked in the winter, sure enough looking through Bin’s, the tell tale sign was there with a female Sparrowhawk tail protruding. Along with the Kestrels, will be good watching their progress. 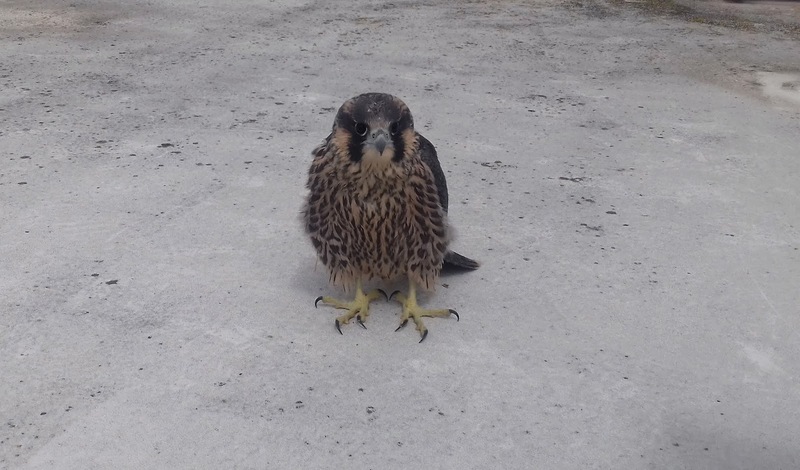 The Kestrels are now taking prey into the box so eggs have hatched and young are present, as yet I have not had a visual with the chicks, likely next week, I am also hoping that fledging will take place without a hitch. 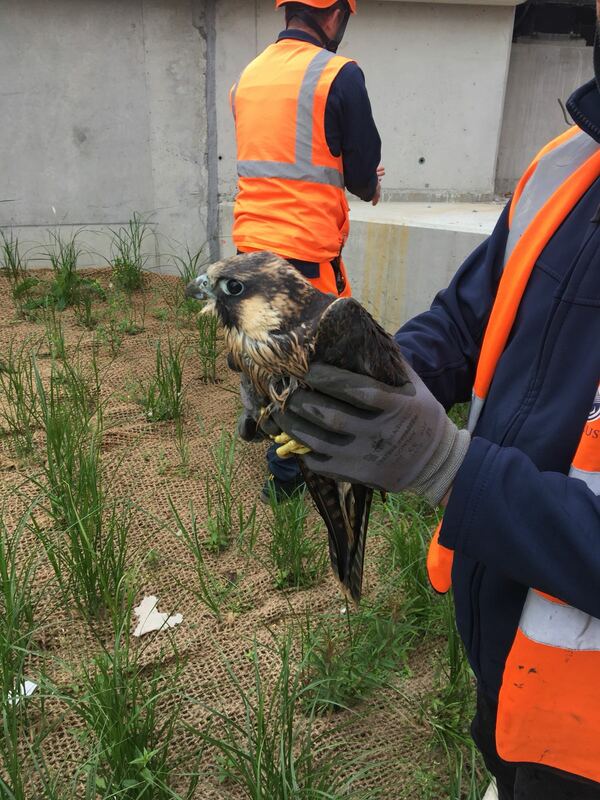 We positioned the box so that the young can access a large roof, hopefully it will give them more room to build wing strength and be better prepared for that all important 1st flight. Plenty of food now going into the box with a Field Mouse seen on Sunday, additionally Lizards are featuring as per last year, they are very efficient little hunters. Top marks also for Thames Water, setting aside large Wildlife Areas, not cutting and leaving to establish and grow wild, already invertebrates are colonising.